Making a Tort Claim | Personal Injury & What is "Tort Law"? Why Hire A Immigration Lawyer or Consultant vs Do-It-Yourself? Our mission is to help you find basic reliable information and web sources for Canada's legal-courts-lawyers services, by province and major cities. "The law affects Canadians every day. There are, we know, laws against crimes such as robbery or murder. But there are also laws that apply to us when we pursue everyday activities, such as driving a car, renting an apartment, getting a job or getting married. In fact, there are laws concerning almost every aspect of our daily lives. 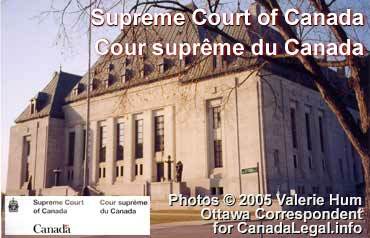 This web site features periodic articles about different aspects of Canada's laws. The articles are chosen to be useful for the lay reader, and have been written by lawyers and other professionals. Making a Tort Claim for Different Aspects of Personal Injury - What is "Tort Law"
When and How - should you settle your claim with ICBC? NB Quotes from websites and publications on this website in no way implies endorsement of this website by the source of the quotes, unless otherwise noted. Materials referred to or cited on this website are intended to provide viewers with potentially useful information sources for their own personal use and is not intended to replace consultation from e.g. an appropriate legal expert-lawyer. When do you need to consult a lawyer in Canada? How do you select a lawyer? What questions to ask when interviewing a lawyer (its a two way selection process). These are some questions we hope to help you with. Why use a Immigration Law Specialist Lawyer? Why not do-it-yourself? General Introduction to Class Action Law Suits for the lay person. An Act to amend the Criminal Code, the Official Secrets Act, the Canada Evidence Act, the Proceeds of Crime (Money Laundering) Act and other Acts, and to enact measures respecting the registration of charities, in order to combat terrorism. This site was developed by a group of people who have served as "expert witnesses" and information consultants for law firms in litigation involving personal injury cases, labor law, wills variation and breach of trust cases as well as class action suits. The development team has also received support from a number of lawyers with different areas of practice. It is our hope that you will find this site useful in your decision making as to consulting or selecting a lawyer for your needs. This site is not endorsed by web sites to which it provides links to, unless otherwise noted e.g. where a lawyer or law firm has volunteered to serve as a reference editor, consultant or content contributor to this site. Jeffrey Lowe, LLB. of Lowe & Co. Canada immigration & business lawyers www.CanadaVisaLaw.com in Vancouver, BC [one of the first law firms in Canada to have a web site in 1997] s/a CanadaTradeJobs.com a new website for recruiting foreign skilled trademen for Canada's booming construction and oil industry in BC and Alberta particularly. Michael Jeffery, LLB (retired) of Jeffery & Calder for introducing me to the field of civil litigation research services in 1984. N. Chan, MSW, Dip. Library Tech.